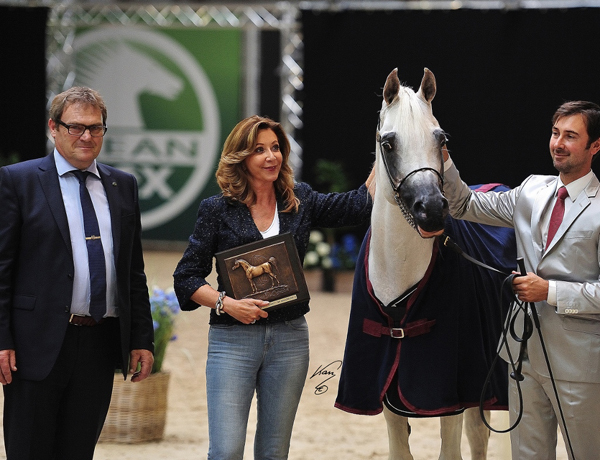 Belgium has awarded their 2016 WAHO Trophy to the internationally renowned stallion, Eternity Ibn Navarrone-D.
Photo L-R: Gerard Oben, Martine Van Hee, Tom Shoukens. He was born into the loving hands of Martine Van Hee on 9th June 1997. Observing his first steps, it struck Martine after only a few minutes… A star was born! Eternity Ibn Navarrone-D follows the lead of his mother: the world-famous mare Navarrone “P”, herself a former winner of Belgium’s WAHO Trophy in 2007. That same honour being conferred to Eternity now, makes Martine very proud. Destiny Bint Eternity-D won gold as a yearling at the Tulip Cup in the Netherlands, gold in Wels (Austria), gold at the Elran Cup and gold at the All Nations Cup. Nijem Ibn Eternity was Triple Crowned Champion. There are many more International and National Champions all over the world! To crown his show record and at the same time end his show career, Eternity was awarded the 2015 Platinum Trophy in Paris. Martine obviously hopes for Eternity to remain in good health for many more years, and for him to produce many more outstanding foals.